It has been too long. There was summer and there were guests and vegetable gardens and events like a big concert and the weekly farmers market and Shakespeare in the Park. The Historical Village volunteers had their annual summer picnic and as it was threatening to rain that afternoon, we ate in the old school house. The first Friday after Labor Day the quilters showed up to transform the school house from a museum into space for a rummage sale. And the next Friday the sale happened and the third Friday we started quilting again. The quilt we set up is a lovely one that Irene brought in. It belongs to a friend of hers. The friend’s grandmother gave her the top as a high school graduation present years and years ago. We figured it might be seventy some years old by now. Wonderful fabrics and a design that doesn’t get tiring. The first week that we worked on it happened to be a school holiday – actually a PIR day whatever that means. So a young Czech girl, Bara, who is living in the valley this semester came to quilting with me. A pleasure to see her take it seriously as Cathryn explained how to make the stitches. Soon they were both sewing and I smiled at how easily the skills were passed along. I doubt if the girl will remember this exact moment later in life but it seems like a significant one to me. Sitting next to Cathryn who has so much grace and wisdom, learning a skill that has been handed down for generations. Cathryn had the patience and the humor to teach Bara, gently helping her to thread the needle and make knots that didn’t pull through the fabric. And Bara trying her best to take small stitches and not be distracted as the other quilters told stories and caught up with each other after the summer. Its good to be back. 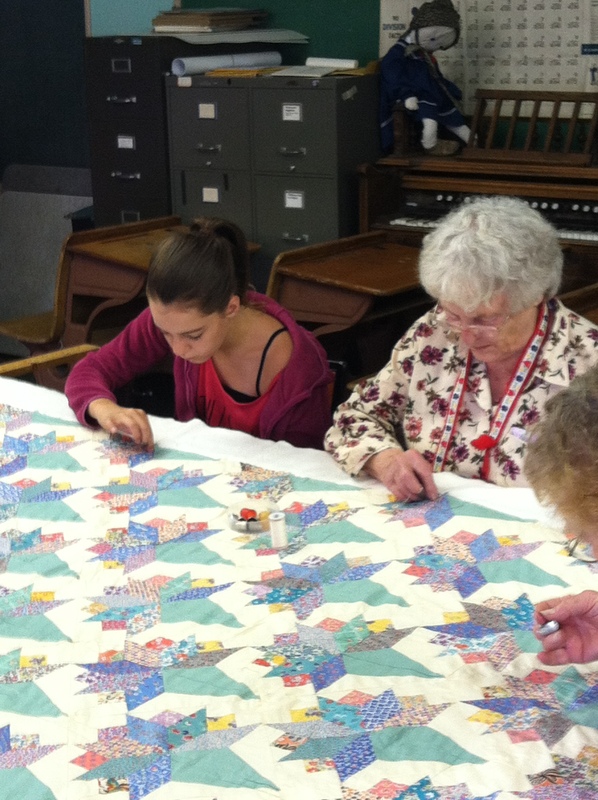 I am glad to be with these women around the quilting frame again. And I am glad that we have the occasional young person who sews with us.